I knew it looks familiar. Blogentry: [builders.reprap.org] // "Biollante Regenerates"
Edited 1 time(s). Last edit at 11/25/2008 06:04PM by sid. Reiyuki, Lord Cat, TylerM, these were the people blogging when I first started looking at Reprap, I haven't seen anything from them lately. I wonder what happened to them and their machines. In my first post you can see all the parts - i added only an L-shape-rail against freerun of the nut and a spring as cartouche-holder. For UV-curable resins (especially "Acrifix 192") i added 6 UV-LED's. Hi Viktor, did you use this one for ceramic slurry? Was thinking about building this for my first tests. My question is, where do you attach it to the reprap. It looks really high, is it stable when printing or do you use it on a McWire type of machine? for ceramic slurry i used another setup with thicker needles (coded green) - but they clogged occasionally after some minutes, so i mixed my own slurries with glass- or ceramic-dust and glycerin or waterglass as paste-basis. Recently i've got some samples of hollow borosilicate glass-spheres in dispersion smaller 0,1mm size (peak at 0,05mm, range from 0,0001 to 0,1mm) what's an interesting fabbing material because of the better fluidity of the spheres in respect to the sharp-edged microparticles of ceramic dust. The actual dispenser is fixed beside my mill-head on the CNC-mill - i posted some images in the german forum, but the posts are truncated and the (embedded) images are gone too. Genau! Think I can forget the idea of mounting that on a BfB Reprap... I'm not a mechanical guy but wouldnt a linear stepper require less space albeit being more expensive. Maybe the pressure generated would be less than this setup? Sad because I love this simple design. I'll look into the original one that Sid posted. Is there an crew working on a 'standardised' syringe design? 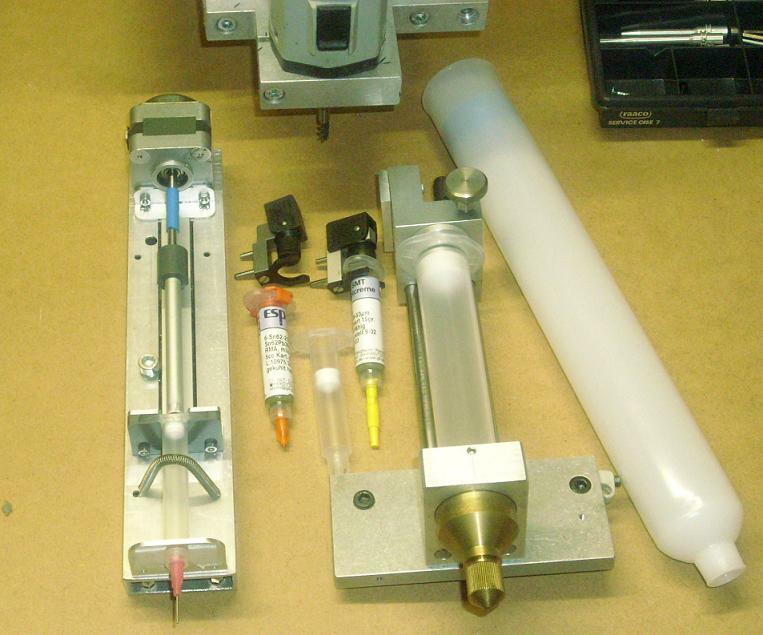 Syringe is referenced all over the wiki but it seems abandoned in favor of the thermoplast extruder way back. Edited 1 time(s). Last edit at 02/26/2009 06:03PM by unfold. if you take a close look, the one I found in the blogs and the one viktor made is technically the same, Viktor just has the necessary plate to mount the motor and syringe to. That's mainly all the difference. And if I got nophead right th one who actually posted the picture I quoted above hasn't been here for a while, so I guess there is no other actually working on a syringe based extruder other than viktor. 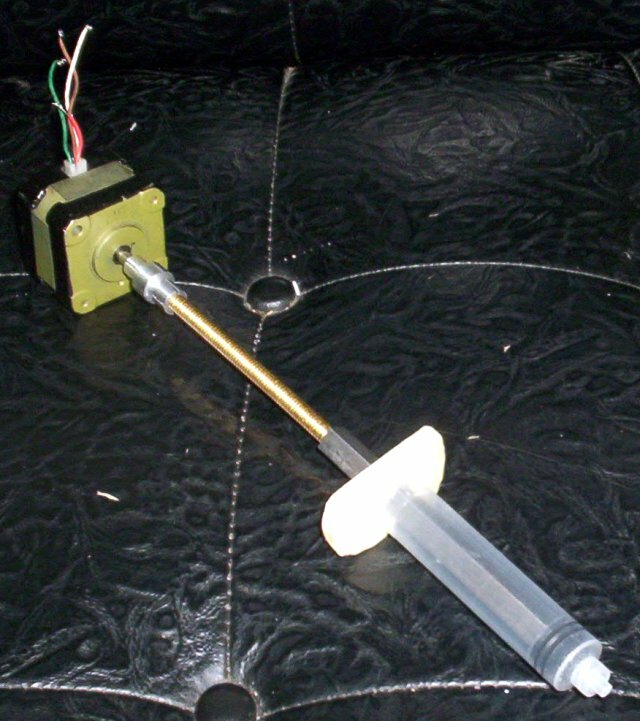 But you can take a look at the [email protected] extruder, they use syringes. ... atached are all my dispensers and cartouches in one image. where are you located - Germany? Iam from Austria and you? Do you have some specs/dimensions? Ja danke für den Link, Spritzen und Kolben hab ich schon. Das Volumen für die Spritze ist maximal 5mlheld, also alles recht klein. Ich muss die Pumpe a bissal anderst bauen. Sollt ichs nicht hinbekommen würd ich mich gern nochmal bei dir melden. Ist das ok für dich? Awesome! Please share the files so that others may try it! ... what files? - the CNC-program was made with IsyCAD, so only usefull for Isel-controlleres ... and only, if you have the right motor. It's easier to design it from scratch with individual numbers, than modify the CNC files.